Chase Marriott Rewards Business Card Confirmed Changes: Both Good & Bad! Chase Marriott Marriott Business Card Details. Changes Are Mostly Positive with a Few Negatives! Marriott Business Card Details. Changes Are Mostly Positive with a Few Negatives! The Marriott/SPG merger is fast approaching and with it, changes to the current line up of credit cards. Credit Card changes have been largely a mixed bag up until this point, but the Marriott Rewards Premier Plus Business Card Changes seem to be positive as a whole. Did we get it right? Chase Set to Release New Marriott Business Card? There are increased earnings on featured categories and a free night worth more than the current free night award. However, there are some draw backs to the new benefit structure. 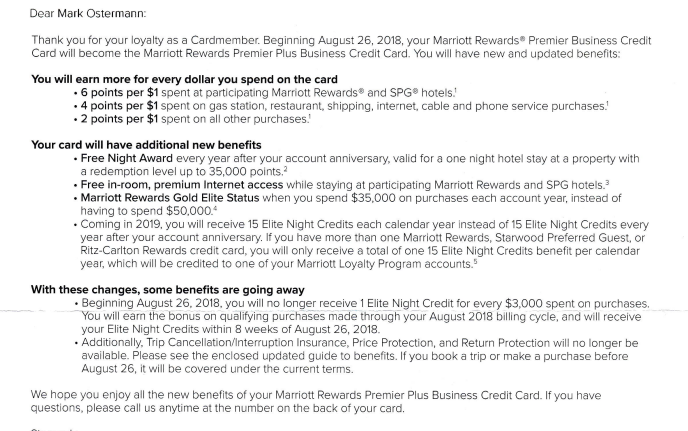 First, you will no longer earn elite night credit for every 3k in spend you make with the card, this is a bummer for people who use their business spend to add a few nights towards status each year. Related: My Marriott/SPG Points Strategy & The One Thing You Need to Do Today Before It’s TOO LATE! According to the letter, the changes are set to go into effect on August 26th, 2018. Some changes will not take place until 2019, such as the 15 elite night credits since they will now be based on the calendar year as opposed to the Cardmember anniversary year. As you can see from the chart, each bonus category is going to earn more points. In fact, earnings are doubling for non- bonus spend and dining, internet, cable and phone service. Gas stations and shipping will now earn 4x points. Overall, this seems to be a win for card members, especially with the increased earnings and award night flexibility. There are some negative changes to consider as well. First, the increased earnings come at a price for those of you who used the elite credits for each 3k in spend to boost your progress to elite status requirements. There are a few other “benefits” listed including free premium in-room internet access and reduced spending requirements for Gold Elite Status. I’m not sure these are of any value to anyone though because Marriott Rewards members get free internet and the new Gold Status is less valuable than the old. Basically, the new Gold Status will be a step down from the old Gold Status and thus should be earned with less spend. Also, in line with other recent changes by Chase, the Trip Cancellation Insurance, Price Protection and Return Protection will be eliminated in their entirety. Here We Go Again: Chase Cutting Benefits and Continuing Trend of Devaluations. Keep in mind, these benefits will not be in effect after this August 26th, so if you previously booked a trip or made a purchase with these benefits in mind, you may want to consider your options. 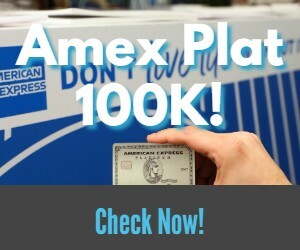 Previous articleMeijer $$$ Making Deal – Discount on Mastercard Gift Cards! Next articleWhy Hotels Charge Resort Fees & A Look At the Overall Cost in Vegas Over Time. The Results Are Surprising! If you currently have a Marriott Biz Card before Aug 26th can you apply for this card as well? Are they different products? I don’t have a Marriott Biz Card yet so I’m wondering if I should apply for the old one AND the new one?